Most times, I can take or leave Facebook and Twitter. But Instagram… I LOVE. Instagram, has introduced me to so many other Austinites, so many other artists and so many other like-minded souls. Thanks to Instagram, I found Katie Stahl of Houndoggle. 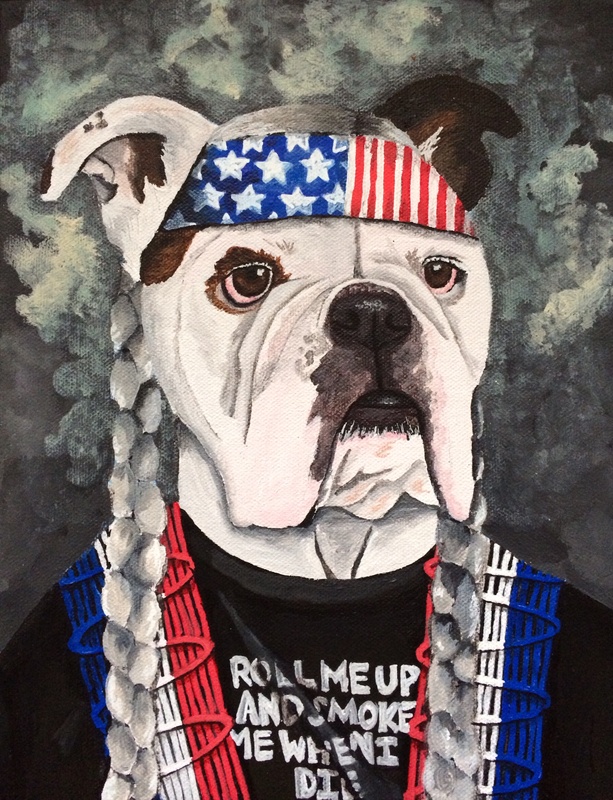 Stahl is a local artist that paints portraits of your fur babies (I’m having her paint a portrait of my little old lady pug, Jazz… I’ll share when it’s done! And, eventually, portraits of my other two boys, Charlie and Nixon). I absolutely adore her work- it is whimsical, warm and truly a personal process as she works to collaborate with you to capture your fur babies personality. I was born and raised in Atlanta. I moved to Austin almost 10 years ago, right after I graduated from college. How did you get into pet portraiture? How long have you been in the business? I started out painting my own dogs, and it grew from there. I officially started Houndoggle about 5 years ago, but my love for painting animals wearing clothes goes way back [see the picture of a roller skating dog that Katie painted when she was seven or eight]. 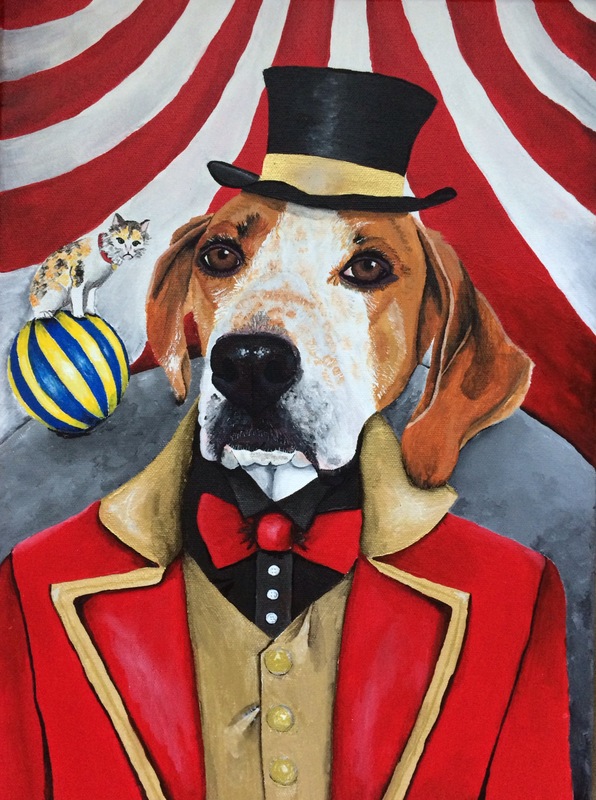 I love using humor and whimsy to convey the unique personality of every animal I paint. What has been your most favorite portrait? 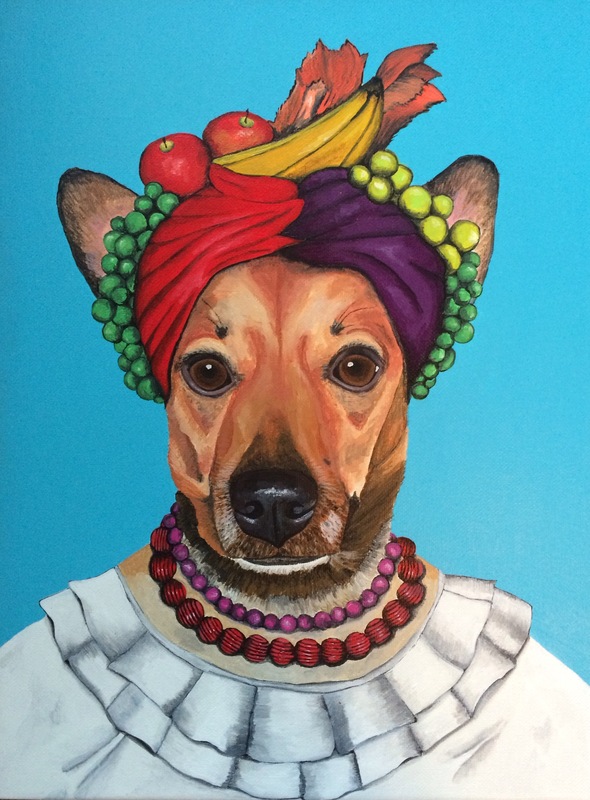 Each painting really is fun in its own way, but I think my personal favorites are “The Good Dog Shepherd,” of a Border Collie painted as a Scottish sheep herder, and “The Dog from Ipanema,” of a Brazilian rescue mix painted as Carmen Miranda. Do you have a favorite local animal shelter? For sentimental reasons, the old Town Lake Animal Shelter is a favorite because that’s where I adopted one of my dogs from. I also think that both Austin Pets Alive and Emancipet do fantastic work. I love living in a city that is so passionately committed to its animals! Growing up, we had two dogs, an English Sheepdog and a rescued spaniel mix, and two cats. Currently, my husband and I have two dogs, an English bulldog named Basil and a spaniel mix named Turtle (both are named after children’s books that I love, Basil from From the Mixed Up Files of Mrs. Basil E. Frankweiler and Turtle from The Westing Game). In no particular order, I enjoy reading, playing board games, walking or biking the Hike and Bike trail, and binge watching TV shows (Gilmore Girls, most recently). I also really enjoy road trips–there are so many great places within driving distance of Austin! What other local artists do you love? Perhaps unsurprisingly, I have a total affinity for animal art. A few Austin-based artists whose work I love are Susan Bell, a ceramicist who makes these wonderful and funny animal sculptures, Eli Halpin, who creates beautiful and colorful oil paintings on wood doors, and Caitlin McClain, who creates really cute paper and fabric products under the name Little Low Studio. Also, I work as an art instructor at The Arc of the Arts, a nonprofit studio and exhibition space for artists with intellectual and developmental disabilities, and I’d recommend that everyone check out their work. Most of the art that I personally own comes from artists at the Arc, and I’m constantly tempted to buy more work, but I have to stop myself since we’re completely out of wall space. So many reasons! I love that Austin is a big city but often feels like a small town. I really appreciate the character of Austin’s various neighborhoods, and especially the eclecticism of South Austin, where we live. I think the people are great, and I appreciate the support that Austinites like to give to local businesses. 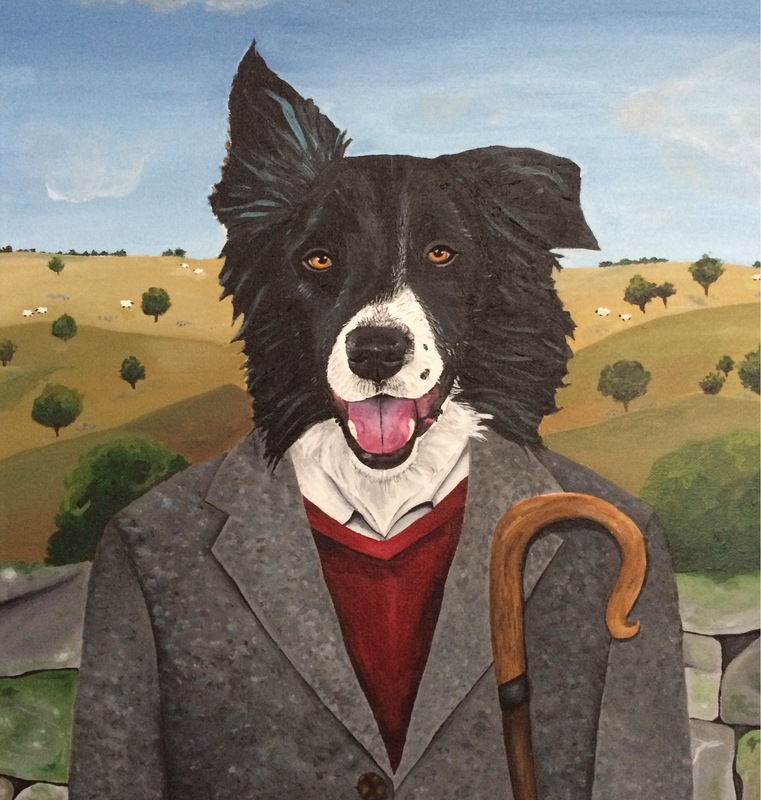 How can anyone interested in getting a portrait of their pets get in contact with you? Email me! You can also find me on Instagram, Facebook, my website, or Etsy, where I sell prints of my work. So there you have it, folks! Go give Katie some love!